It was nice to meet you the other day Scott. Enjoy Paris! He looks so glad he's got his picture taken. Really like the duffel coat. Such a fantastic classic outfit. I like it when men wear turtlenecks. i love the colors and textures of what he's wearing! plus it looks like it was a beautiful day – so jealous! i really like this a lot. something about the comfort, the nonchalance, and that fabulous grey coat. Love that jacket…I'd buy it for me in a smaller size! I don't even really know what I love so much about this, but it feels just perfect. So…cohesive! And personal. He feels like a very nice teacher. don't you just love when men know how to dress!!! and he looks so fabulous!!!! beautiful jacket!!! I'm totally in love with the coat ! so chic ! i'd love to offer one like that to my man. Does anyone know the brand? Beautiful jacket, love the combination of good-quality, well-made woolens. I love that coat! What a classic outfit. I'm partial to Gentleman designers who worked their heels off to earn a place in history. 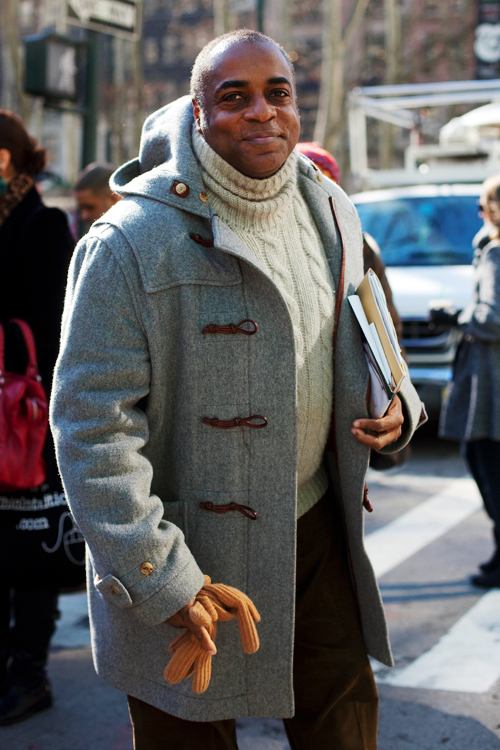 Mr. Jeffrey Banks is a Classicist: the cool (tone) of the heather toggle coat, creamy turtleneck, and chocolatey trousers. man i love turtlenecks! love the cable sweater and toggle coat.. great combo. THose camel gloves go perfectly! So jealous of his gloves! And the coat is fabulous as well. That stylee coat could make any outfit work. Classic. this is the epitome of handsome casual! Excellent coat and attitude. The brown of the toggles paired with the pants is a great touch. Leaves me thinking.. have you ever considered to come to south america as well? I'm from Argentina and will love that you come visit us in Buenos Aires! No doubt there are plenty of men and women with strong sense of fashion in the streets. Anyway.. you are personally invited! beyond spectacular! the smile, light grey heather and soft natural fisherman knit. the slight shot of color in the gloves. And, again the smile–it shows kindness and spirit. And the paperwork… he looks smart not just stylish… one of the best shots EVER! His smile is as adorable as his outfit! Iconic. Jeffery is always on point. Simple and classy, a perfect match. I love it! the look on this man's face is so mellow. He looks like such a nice person. And his coat is awesome too. Mr. Banks looks cosy warm. Even his eyes and smile are warm! I LOVE the pumpkin gloves! I love the toggle coat. you will always look classic when you have one of these on. Well, at least he's dressed for the weather. Nice coat, better smile. Just shows what fashion is all about. He looks so easy-going in that beautiful coat and the pull-over. Cool dude. Very nice jacket and gloves, casual class, i love it! oooo love the peachy gloves! There is nothing better than a duffle coat to keep you warm in winter. I love the colour of this one. I have a duffle coat from Burberry that is over 20 years old and still looks great. I wear it every day in winter. Looks great with jeans or with a short skirt with boots. He looks like a jolly fisherman, a very good look! He looks like a teddy bear. Cute, cuddly and this smile of him, soooo nice. And his style is nice too. I am, in general, very happily surprised by the style of New Yorkers in your pictures. They seem to have a way of dressing which is harmonious and relaxed without being over the top or too sophisticated. This picture is a great example: the man has find a combination of colours, shapes, textures that looks effortless ! Thanks for sharing. I don't know who Mr. Banks is, but he sure looks great! Mr Banks. Soo beautiful!! Very pleasant, indeed! Jeffrey looks as chic as ever! Love the toggles on his coat and the soft cashmere gloves that match the cashmere sweater. he seems to know exactly what hes doing. I love the coat, you can almost feel the textures of the different pieces (coat, sweater, gloves). What a lovely photograph Scott. This gentleman looks so comfortable and stylish. I love his winter coat and the ease of the beautiful turtleneck underneath. His entire outfit "works". I love it. Crisp look. He looks very comfortable and well dressed. Nothing like the little details to pull a look togeather. Love that leather trim on his toggle coat. I love it when people look warm and comfortable in their clothes. He does. 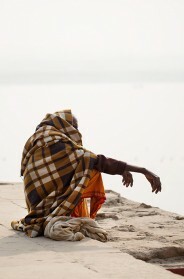 Love this – beautiful colour/texture combinations, and a beatific expression on your subject's face. His outfit makes him look like someone it would be a pleasure to meet. When I was in college, '82-'86, I regularly saved money to buy Jeffrey Banks shirts and ties, elegant and colorful takes on the classics that always drew compliments. Glad to see him still around. Great photo! I like how comfortable he looks in this outfit. Way too many people think that comfortable equals sloppy. he looks like he's a joy to be around – and the orange gloves are superb! favorite part of this outfit…the HOOD…he has adjusted it to be propped perfectly up against the back of his neck..it's not flat nor falling prey to one side or the other..LOVE this look. Jealous of those gloves, gotta get me a pair!! Mr. Jeffrey Banks. Always classic. what a beautiful coat – perfect shade for him – gorgeous! I agree wholeheartedly with Davidikus's comments (6:34 AM). What a wonderful photo. Love his coat and his smile. I just love seeing Mr. Banks, let's face it most people in the fashion industry take themselves far too seriously and oftentimes forget to smile! He always looks approachable even if not smiling – GR8 shot! I bought a similar one from Burberrys women, same color, and has been the sucess of the season. So classic but always in. Very nice – a great looking man! Great coat & sweater. Love the smile! I love Mr Banks friendly attitude! hey, it's nice to see a familiar face – he has always worn those clothes and that smile, that's jeff! wonderful photo. coupled with the best jacket~! A tweedy hoodie is the kind of man-chic the defies pretension. Very hip. It's nice to see a normal person here who just owns nice things, throws them on and goes about their day because they actually have something to do. I have a coat just like that. One of the best buys I ever made: got it at a deep, deep discount too.